Bake 30 to 35 min. or until casserole is heated through and potato nuggets are golden brown. Prep Time: 15 min. | Total Time: 50 min. Per Serving (reg ground beef, reg cheddar, OM reg Bacon): 310 calories, 19g total fat, 7g saturated fat, 55mg cholesterol, 690mg sodium, 18g carbohydrate, less than 1g dietary fiber, 4g sugars, 17g protein, 6%DV vitamin A, 4%DV vitamin C, 10%DV calcium, 10%DV iron. Per Serving (extra lean; 2% cheddar; turkey bacon): 260 calories, 13g total fat, 4.5g saturated fat, 55mg cholesterol, 740mg sodium, 18g carbohydrate, less than 1g dietary fiber, 4g sugars, 18g protein, 4%DV vitamin A, 4%DV vitamin C, 20%DV calcium, 10%DV iron. Add 1 chopped tomato to cooked meat along with the ketchup and mustard. Bake large quantities of bacon ahead of time in the oven. It will make mealtime quick and easy when preparing recipes like this. Keep refrigerated, then pull it out and use whole in sandwiches, or crumble and use in your favorite recipes. Stock up on bacon when it's on sale. Place the wrapped packages in freezer-weight resealable plastic bags, then freeze up to 6 months. Thaw in refrigerator before using. 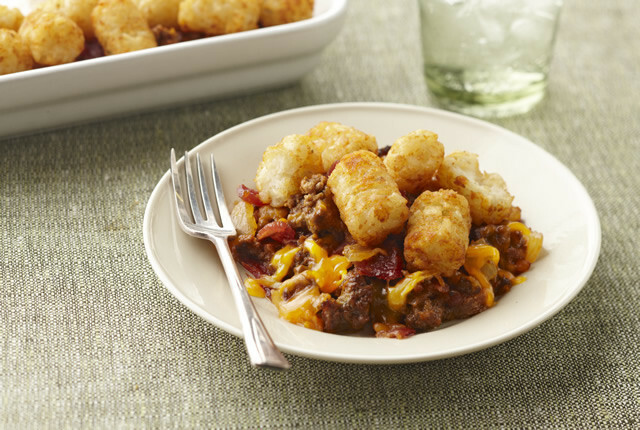 Save 50 calories and 6g of fat per serving by preparing with extra-lean ground beef, KRAFT 2% Milk Shredded Cheddar Cheese and OSCAR MAYER Turkey Bacon.